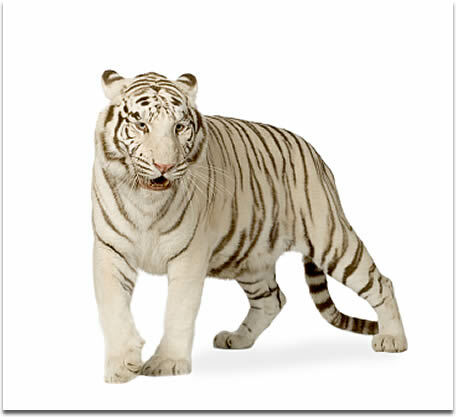 The white tiger is a pigmentation variant of the Bengal tiger. Rewa was a Princely State, famous for its white tigers, the first one, nicknamed Mohan, was caught in Rewa. In contrast to what some believe, the White Tiger is neither a subspecies in its own right, nor an albino form of a ‘normal’ tiger. Rather, it is simply a rare form of Bengal Tiger that possesses a specific gene, giving it a lighter appearance. This variation is truly exquisite, giving the White Tiger an undeniable sense of mystery and beauty. The scientific name of the White Tiger is Pantheratigris, and some say it is a result of inbreeding. 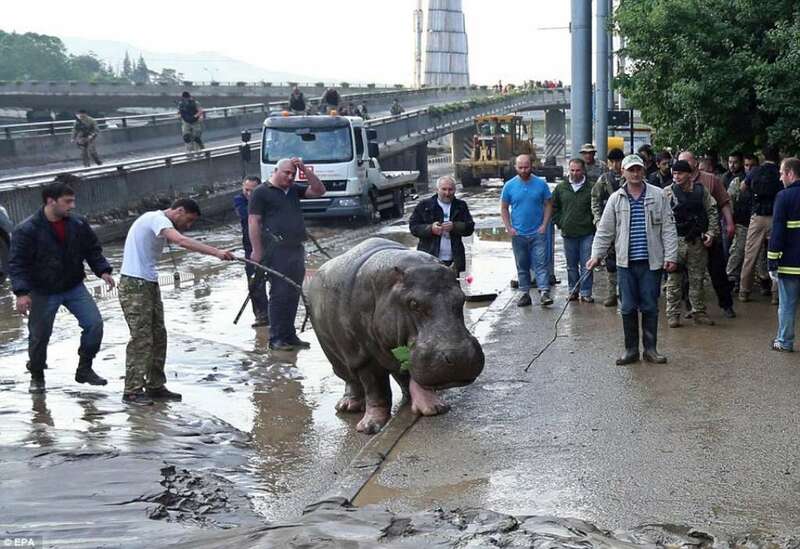 I have recently posted on animals escapade following flash floods in Tbilisi, the capital of Georgia. Heavy rains and wind hit Tbilisi turning a normally small stream that runs through the hilly city into a surging river. The flooding damaged houses. Cars and debris were seen floating along the once busy streets – and wild animals reportedly were roaming on the streets, having escaped from the Zoo. Not any happy ending but a pitiful one for – those escaped Bears, tigers and wolves were seen dead with carcasses littering on the filthy streets of Tbilisi. Only the darted hippo made it safe. Burials had to be hastily prepared for bears, tigers and wolves that all lay in the mud of the Georgian capital. Flash flooding in the Georgian capital had destroyed the animal's enclosures at Tbilisi zoo and turned it into a 'hellish whirlpool', leaving them free to roam the streets in scenes reminiscent of a Hollywood disaster movie. Later when the clean-up operations began – they had only to clear the carcasses of bears, tigers and wolves that all lay in a heap in the murky sludge of the capital city's streets. Animals lying in the sludge was a ghastly sight. Residents had been warned to stay indoors and particularly away from the area next to the zoo as a number of wild beasts werel unaccounted for, with fears they could be wandering the hills of the Georgian capital. The Zoo was trying to determine what had happened to four lions, three tigers and one jaguar and host of other animals that escaped. Helicopters continued to circle the city hunting for big game to track down the hungry and dangerous animals. The flooding also killed about 60 of 300 homeless dogs at a private shelter near the zoo, shelter staff said. 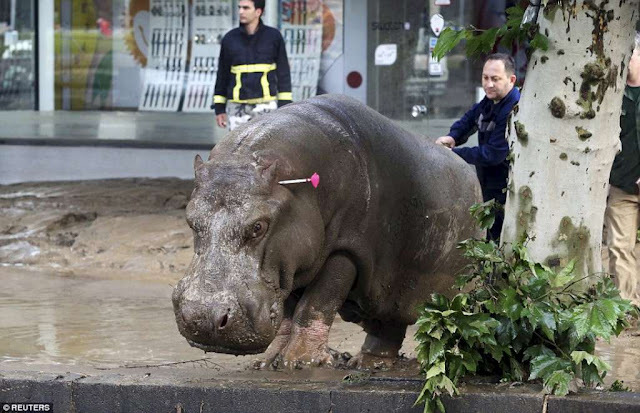 A hippopotamus was seen on the roads – it was tranquilized, cornered and later taken to its confines. Other animals were not so lucky. The Zoo authorities also requested public not to resort to shooting of animals when sighted, unless the predators were seen attacking people. A spokesperson of the Zoo said 20 wolves, eight lions and an unspecified number of tigers, jackals, bears and jaguars had been shot dead or were still missing from the zoo. 'Only three out of our 17 penguins were saved,' she added.Six wolves were shot dead at a children's hospital, as a bear was seen clinging on for life on an air conditioning unit of a second floor building above a flooded street. The heavy rain that lashed the city turned the Vereriver that flows through the hilly city into a surging river that swept away cars and buildings, flooded squares and damaged power lines.Several main roads were destroyed and half a dozen coffins in a city cemetery were washed out of the ground. 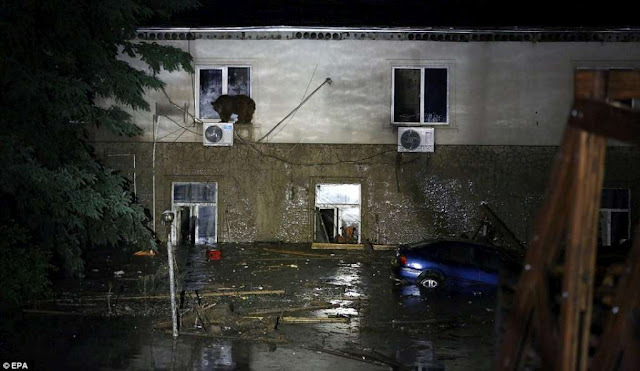 Rescue workers were searching submerged buildings to check for trapped residents and the clean-up operation resumed with people working together to dig out cars wedged in the mud and clear the carcasses of the fallen beasts. It is estimated the floods have caused £6.5million worth of damage. Prague Zoo, which suffered from the devastating flooding that hit the Czech capital in 2002 and again in 2013, reportedlysent a team to Tbilisi volunteering help. To add to the chaos, oneof the tigers that escaped during devastating floods, killed a man in front of horrified passers-by after four days on the loose.News of the death followed claims that all the big cats from the city’s zoo had been found dead.The Interior Ministry said police shot the tiger dead after it attacked a group of men earlier today, killing one and injuring another. It was a white tiger, a big one. It attacked a man, it seized him by the throat,” a witness told Georgia's Imedi channel. The white tiger had escaped detection by hiding at an abandoned factory,a spokesperson for the Interior Ministry said. The animal was initially reported to be a lion. The victim, named locally as OtarTsukhishvili, was mauled to death when he entered a warehouse where the animal had hidden for 3 days. Another victim, who survived, was bitten on his arm as other people ran from the warehouse in a panic. More panic was to follow after Rustavi-2 TV channel reported calls from locals that a hyena was on the loose in the city. It was a distressing sight of the killed animal, and municipal workers dragging out of mud many other animals which had died and were in mud inundated waters. Meanwhile, an African penguin that escaped from the zoo is believed to have been found in neighbouring Azerbaijan after swimming 30 miles along the river from Tbilisi. A large crocodile found under a pile of wood and debris was hauled to safety. Zookeepers say that of the roughly 600 animals in their care, more than half had perished in a 'hellish whirlpool' or died at the hands of the authorities.It remains unclear how many were shot dead by police and in some cases by general public, but they include lions, tigers and wolves; and in some cases, there was no real need for killing them. This hippo survived though ! !